Houghton Mifflin. 257 pp. $15.95. Since leaving the Presidency, Jimmy Carter has devoted much of his time to the Arab-­Israeli conflict. His well-publicized activities have included participa­tion at Anwar Sadat's funeral, trav­eling through the Middle East in early 1983, and presiding over an international conference in Atlanta later in 1983. He has also been en­gaged in less public endeavors; this reviewer, for example, attended a long day's meeting in New York devoted to the Middle East which Mr. Carter sat through with great patience. The source of Mr. Carter's con­tinued interest in the Arab-Israeli conflict is not hard to find: to some extent his personal faith plays a part, but principally it is the fact that as President his only major achievement lay in helping Egypt and Israel make peace. For wholly understandable reasons, he does not wish to relinquish the glory of that achievement. Then, too, the Middle East - the Carter adminis­tration's strongest suit and the Reagan administration's weakest -­ offers a unique avenue to score some points against his successor. Perhaps even more important, the Arab-Israeli conflict presents the ex-president with his best opportu­nity to regain a voice in public affairs. 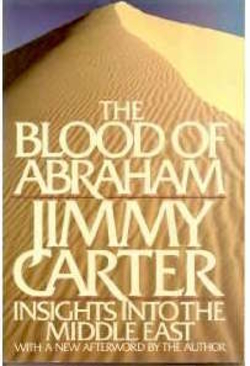 In light of these purposes, how does Mr. Carter fare in The Blood of Abraham? He attempts two tasks: to explain the Arab•Israeli conflict and to propose the main lines of American policy in the Middle East. First, as the book's lugubrious title implies, Mr. Carter under­stands the Arab-Israeli conflict primarily in terms of religious dif­ferences. He believes that today's problems derive from the distant past: "To understand the roots of the hatred and bloodshed that still shape the relationships among the people of the region, it is useful to go back to the holy scriptures of ancient times." Unfortunately, Mr. Carter fails in his efforts to relate current Middle East politics to the Bible and the Koran. As with others who view current affairs through this prism, the former president confuses the very real and powerful force of religious feeling with the abstractions of religious doctrine. Ignoring changed circumstances, he all too readily sees 20th-century protagonists acting under the com­pulsion of inherited drives. He for­gets, for instance, that the Bible knows no Muslims and the Koran knows no Zionists. Thus, the argument that "con­tinuing bloodshed" is "caused by the ancient rivalries between the Israelis and Arabs and among the Christians and Muslims" entirely misses the point. The first armed clash between Zionists and Arabs took place only in 1911; and to­day's fighting in Lebanon goes back to 1860. Both these conflicts derive from incompatible nation­alist claims first espoused in the 19th century; they cannot be satis­factorily explained by "ancient rivalries." Mr. Carter makes many other ele­mentary mistakes in attempting to interpret the background of cur­rent problems. Revealingly, he more than once refers to "Arab, Jew, and Christian"- as though "Arab" were a religious category analogous to "Jewish" and "Chris­tian," and as though most of the Christians of the Middle East did not speak Arabic. He writes that Golda Meir was "born in America" (it was actually Russia). He asserts that Israel tripled the land under its control in 1967 at the expense of "Egypt, Jordan, the Palestinians, and Syria." The Palestinians? Which territories had they con­trolled? Mr. Carter describes Leba­non as "the most ravaged, the most shattered, country on the face of the globe," as though vastly more destruction has not been wrought in Afghanistan and Cambodia. He writes about Lebanon that except for the Syrians and Israelis, "all other foreign troops were out of the country" by January 1985 - ignoring the presence of Iranians in the Bekaa Valley, the French in Beirut, and the many nationalities represented in UNIFIL in the south. In addition to these and other errors, many passages are inconsis­tent. For example, we read that "Begin had come to Camp David intending to work out a statement of general principles for a peace agreement, then to leave to subor­dinates the task of resolving the more difficult issues." A few lines further down: "After detailed negotiations began, Begin spent the best part of his energy on the minute details of each proposal, the specific language of each sen­tence or phrase." Nowhere does Mr. Carter explain the apparent contradiction between these obser­vations. As his second goal, Mr. Carter hopes to influence U.S. policy to­ward the Arab-Israeli conflict. In his view, "the situation in the Mid­dle East continues to be unstable because of two crucial factors. First, the Arabs refuse to give clear and official recognition to the right of Israel to exist in peace within clearly defined and secure borders. Second, the Israelis refuse to with­draw from the occupied territories and to grant the Palestinians their basic human rights, including self-­determination." Characteristically, this analysis is worded so as not to place greater blame on either side. As anyone who followed American politics in the late 1970's might guess, Mr. Carter's proposed solu­tion lies in asking the two sides to halve their difference: "The Arabs must recognize the reality that is Israel, just as the Israelis must ac­knowledge Palestinian claims." How to achieve this? The former President sees the two sides as hopelessly paralyzed and therefore unable to act. Arguing that the "antagonists cannot be expected to take the initiative," he places the burden of bringing them together on the United States. "The U.S. Secretary of State [must] explore the options [of an international forum] unofficially among the dis­puting powers to ascertain as broad a base of potential agreement as possible. On this can be initiated semi-official and then official peace talks." In other words, the sponsor of the October 1977 U.S.-Soviet communique and the Camp David summit is calling on his successor to do exactly as he did. Not surprisingly, Mr. Carter ex­presses great displeasure that the Camp David accords are not work­ing out as he planned. But, char­acteristically, he cannot make up his mind whom to blame. On sev­eral occasions he holds Israel re­sponsible: "The commitments made at Camp David concerning the oc­cupied territories and rights of the Palestinians have not been hon­ored." Also, he argues that a May 1981 statement in which Prime Minister Begin promised never to leave the West Bank or Gaza "con­travenes the basic terms of the Camp David accords." But he also states that "the terms of the treaty have been observed by both sides." Which is it? The vacillating qualities that marked Mr. Carter's career as a politician remain entirely with him as a writer. Despite his many drawbacks as an analyst of the Arab-Israeli con­flict, Mr. Carter does occasionally provide sharp insights. With refer­ence to Syria, for instance, he has the perspicacity to foresee that the radical fundamentalist Shiites of southern Lebanon, although receiv­ing support from Damascus, pose a long-range danger to the regime of Hafez al-Assad. He also understands that Syrian forces expelled Arafat from Lebanon in December 1983 so that Assad would be in a position to dominate the PLO. Few other Western politicians have so clearly grasped this purpose. For every such insight of value, however, Mr. Carter provides many that are ill-judged. Although recognizing Hafez al-Assad as the ambitious tyrant he is, Mr. Carter inexplicably believes that he could "be a prime catalyst in achieving an overall peace agreement in the Mid­dle East." True to form, Mr. Carter is unable to condemn even the bloodthirsty ruler of Damascus. In sum, The Blood of Abraham is a thoroughly amateurish ven­ture. As a former president, Mr. Carter suffers from a special dis­ability in his efforts to write on current affairs. Anything he writes will get printed - a nearly irresistible invitation to self-indul­gence. This book contains nothing of note; only the author's former eminence guaranteed that it would find a publisher. Daniel Pipes is associate professor at the Naval War College, and the author of In the Path of God: Islam and Political Power.